In a retrospect of the recent Christmas season, I caught myself in a special moment shared with one of my sons. We were playing with one of their new Christmas toys. I remember the moment for a couple of reasons. The first was that we were sitting on the floor together with him sitting directly in front of me with his back to me and my legs wrapped around him and his play area in a way that almost enveloped his whole world. The second detail was the particular toy that my son was playing with. 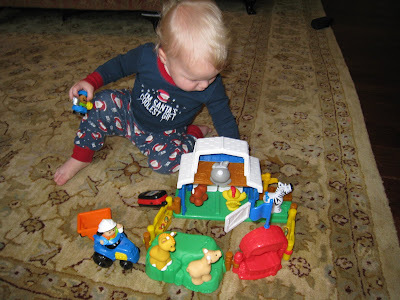 He had recently received a barnyard playset, complete with animals, barn, and crops. Am I really much different in my daily life in my relationship with God? I go about, in all seriousness, acting out the duties of my occupation while God surrounds my life and showers me with His love and care. How often do I sit with my back to Him and only turn to face Him when I am frustrated or if I seek approval for my actions? As these thoughts faded from frontal lobe, I gave him another hug that he shrugged off and decided...let's go get some CHEESY PUFFS. i'm k's mom and the triplets's "grancy." what a great explanation about God's love and care for us. enjoy checking in on your blog.